D. leucomelas: Venezuela, parts of Guyana, Brazil, and the extreme easternmost part of Colombia. D. leucomelas – Black with irregular bright yellow stripes that crisscross the body. About the Animal: Dart Frogs, also called Poison Arrow Frogs, belong to a large family containing more the 100 species of neo-tropical frogs that excrete neurotoxin through the skin. In the wild this is an excellent defense against a variety of predators, as very few are immune to this tiny frogs’ lethal defense. Arrow Frogs are territorial species that is bold and aggressive. These beautiful, bright amphibian jewels are eye catching, aiding the frog in territory defense displays and warning predators that it is poisonous. Both species tend to like dark, moist areas, and may be difficult to see, despite the bright colors. 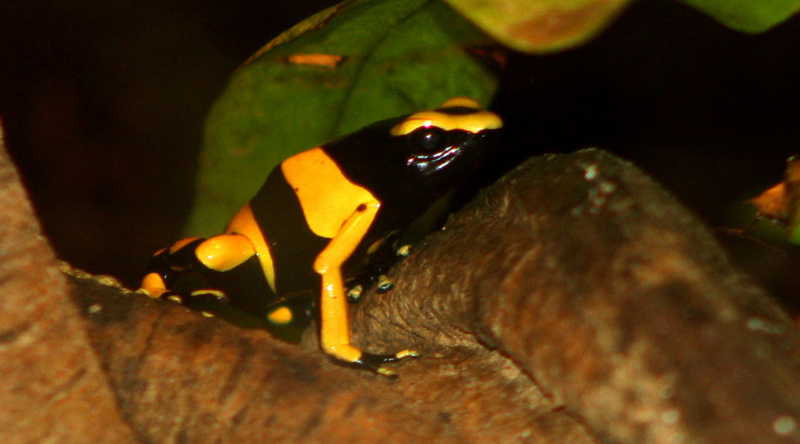 Mating and Reproduction: In Yellow Banded Dart Frogs, the eggs are laid on a damp surface, such as leaf. After the clutch is laid, the parents usually stay in the area until the eggs hatch. Once the tadpoles hatch, the male transports them from water source to water source in order to protect the vulnerable tadpoles from predators. Every couple of days the female will come by and lay a couple of infertile eggs for the tadpoles to eat. 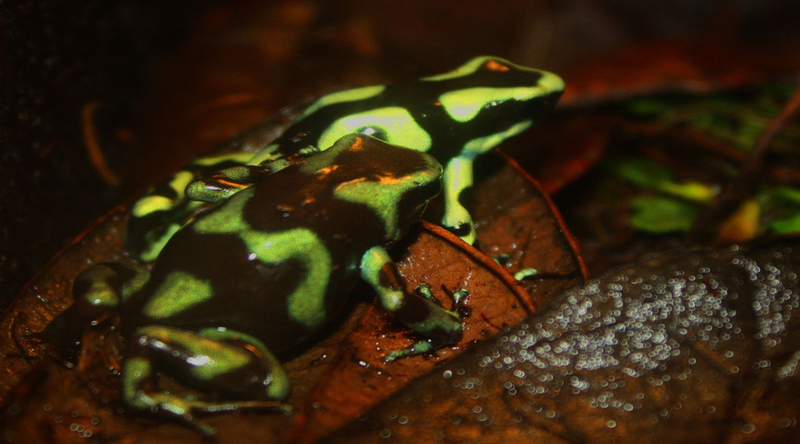 In Green and Black Dart frogs, after courtship the female lays up to six eggs in a small pool of water. She returns to check on the eggs periodically. After hatching, the tadpoles climb onto the female’s back and are carried to a larger body of water. Once they reach a lake or stream, they’re on their own. Amazing Information: Because of their diet, captive bred frogs are non-toxic and perfectly safe to handle.